Such is life.Nothing is assured and nothing is guaranteed as well. Why go so far? What about marriage, are you asking me? Oh-boy! Tell me about it. Falling is love, maybe is not super easy, but quite possible. Thereafter once we tie the knot or slip the ring on each other? Reality sets in and the discoveries we actually find out? The discoveries to compatibility which can throw us off-guard, specifically food compatibility His and ours. My other half-half? Well, I sort of knew about his profound love for Indian food. But I didn't really find out if he will be okay to other kinda food. Take for example, rice congee/rice porridge which by far is the food in Chinese households compared to us Indians. I on the other hand, I simply adore Chinese food and porridge is the love of my food love too. But my man? Mmmmm! He won't get close. He just won't. What more pretty much can I say? Force him, literally? I tried, not forcing though. A small time talk every now and then, yet, it didn't work and I gave up. No point. I suppose sometimes this thing to forcing or sweet talking does not really work? I know. So, the alternative for me is making rice congee for my own eating pleasure when he is away. Settled. 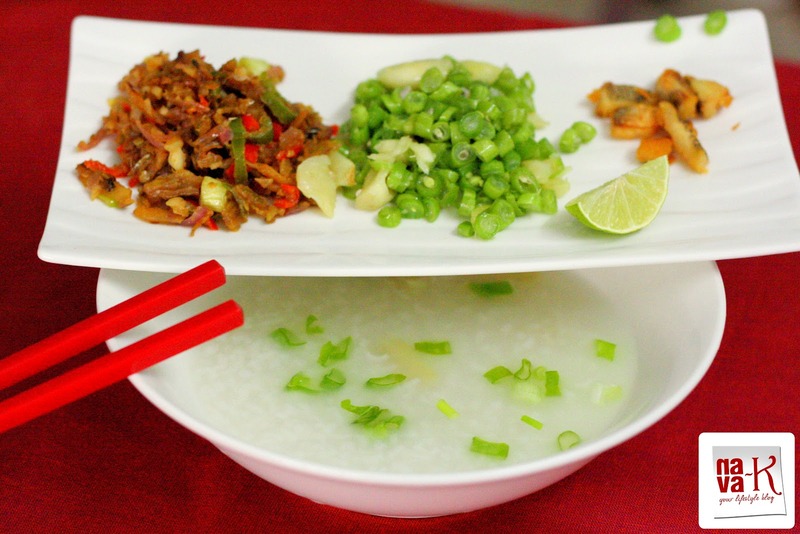 Rice congee can be made in rice cooker, slow cooker or over the stove. Of course, some salt goes in and plain rice congee lemme tell you is quite bland. So, we should think of side dishes to go with it. As many side dishes as you wish, depending on if time is on your side, otherwise, like for this rice congee, jiffy stir Fried Beans Garlic, Fried Salted Fish and Chilli Tauchu/Fermented Black Beans Bilis/Anchovies. 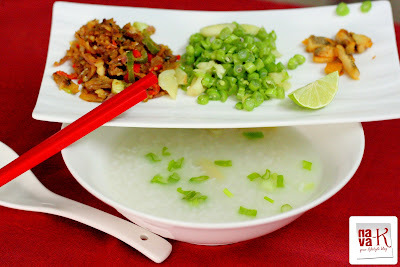 Our go to Malaysian Style Rice Congee With Condiments. Add all ingredients except spring onion into a pot. Simmer and cook over low heat until rice is softened (as soft as you like). Heat oil and when heated, saute garlic. Add beans and season with salt. Stir to cook and soften. Leave about 1 tbsp of oil in the same pan. Add chillies, onion and tauchu. Add sugar, salt and spring onion. Stir to combine and remove from heat. Into a serving bowl, add rice congee and top with spring onion and ginger. Serve with the condiments and lime wedges (to be squeezed over anchovies/ikan bilis). I surely need some Congee today for I don't feel so well. I can see how this would make for a perfect meal. hi nava, i like my congee very soft soup like. nice side dishes, yes, salted egg is a must for me..
Ohhh, rice congee is such a comforting food, Nava! A warm bowl of it could surely make anyone feel better! I love your choice of condiments! Yum! I'm not a big fan of congee but this dish looks wonderful. So colourful and healthy! I like cream of wheat and also grits, so I am sure I would like your Congee. 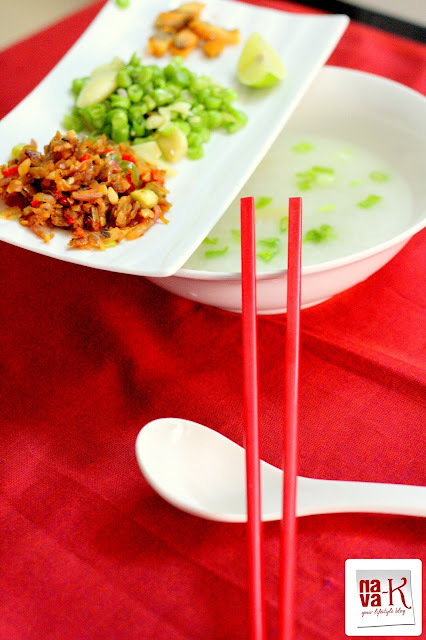 While the others are mostly served on the sweet side, the idea of the Congee sounds like a tasty change of pace. Easy dish and so very healthy, thanks for posting. Nava, your photos are lovely! I would definitely add the green onions, both for the color and flavor. As I love rice based dishes this is something new for me to try. This looks so yummy. I love congee. Will have to try this. i like this! simple, easy to prepare, healthy and easy to digest! yuuuummm! this made me hungry! i loooove congee!